For decades we have been exposed to carcinogens called phthalates. They are incorporated into foods, personal care products (including cosmetics), pharmaceuticals (including prescription drugs and especially enteric-coated drugs), lubricants, detergents, building materials and the majority of household cleaning products. These compounds have been introduced into every niche of our environment by being the primary synthetic compound that is used in the plastic industry to soften polyvinyl chloride (PVC). Being as prevalent as plastic is, the phthalates used in plastics have slowly leached into the environment. Phthalates are used to increase the transparency, durability, longevity and flexibility of all of the products mentioned above. Only recently have international health agencies recognized the fact that phthalates are linked with breast cancer, asthma in children, overall endocrine (hormonal) disruption, obesity (especially in children), insulin resistance, and overt diabetes mellitus type 2 (which is strongly linked with the development of obesity). The overall response by these health agencies was to propose a switch from low molecular weight phthalates (the ones linked with all the diseases mentioned above) to higher molecular weight phthalates. Apparently, the high molecular phthalates are more stable and thus do no leach into the environment as easily. The problem is that the switching process is gradual and also that the safety of high molecular weigh phthalates has not been conclusively determined. Recent data shows that the tolerable intake of phthalates in children is exceeded 20-fold in some instances! And a 2008 study found that higher dust concentrations of phalates were found in homes of children with asthma and other allergies. Baby body care products (such as lotion, infant shampoo, and infant powder) usually contain a very high level of phthalates and are a major source of these toxic compounds in the baby’s environment. Children that are hospitalized are at the highest risk of exposure, due to the fact that all plastic hospital equipment (such as respiratory tubing, IV catheters, nasogastric tubes, gloves) contain extremely high level of phthalates that leach easily out of these items due to warming when exposed to body temperature. Phthalates have very weak chemical bonds with the plastic which makes them leach out of the plastic when the surrounding temperature is raised even slightly. Two studies (Davis et al. 1994 and Lopez-Carillon et al. 2010) have shown an association between phthalate exposure and urine levels due to exposure to cosmetics and personal care products and the development of breast cancer. The conclusion was that phthalates act as endocrine (hormonal) disruptors. Since breast cancer usually develops due to excessive exposure to the hormone estrogen (or estrogen-like compounds found in the environment), it makes sense that phthalates may be linked to hormone-sensitive cancers such as breast cancer since they are endocrine disruptors. Studies in rodents have shown that phthalate exposure leads to lower levels of male hormones being produced by the testes. On the other hand, human phthalate exposure during pregnancy has shown a decreased ano-genital distance among baby boys. It is still being determined it this decreased distance has any relevancy with respect to any disease, especially later in life. Several phthalates have been shown to have a statistically significant correlation with insulin resistance (the precursor to diabetes mellitus type 2) and obesity. This is an extremely important point as the diabetic and obesity problem has reached epidemic proportions in our society. Until now, the overall opinion was that the obesity/diabetes epidemic was mainly caused by lack of exercise and sedentary lifestyle, and also by diets high in simple carbohydrates and processed foods. However, as these correlations show, another major contributing factor may be the exposure to these ubiquitous toxic chemicals. So what can be done to decrease our exposure to these toxins? Only a reduction in exposure is possible at this point. Full isolation is not possible (unless you move to Alaska in the middle of a forest) because of our environment, including the phthalate-saturated air we breathe. But reduction in exposure is definitely possible. For one, try not to buy products that are stored in plastics. A perfect example is water in plastic bottles. 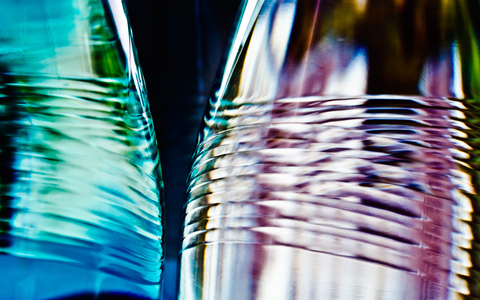 Buy water in glass bottles, or filter your own with a Brita filter (for example) and after the filtering, store your water in glass flasks or glass bottles. The second major way to decrease exposure is to buy only products that are phthalate-free. This is especially true of cosmetics and housecleaning products (exposure to both allows phthalates to enter the body by penetrating the skin). These natural products are slightly more expensive than what you may find in your local drug store, but that’s because they contain the safe (usually natural) stabilizers that are not harmful to your body, which have a higher cost. Fortunately Vitarock.com reflects this philosophy by providing only safe products without toxic compounds such as phthalates. Here you can find products ranging from cosmetics to household cleaning products that are phthalate free. Personally, I think that choosing Pure, Green, Safe & Fair products is extremely important for baby care and cosmetic products. Stay healthy my friends, and see you next time.